The new Jewels lighting series! Hanging all together the lighting system turns into a beautiful landscape of sparkling lights or even a star filled sky. The Jewels are made out of anodized aluminum, combined with retro A++ lightbulbs the fixture is chic, yet playful and truly decorates the whole room. 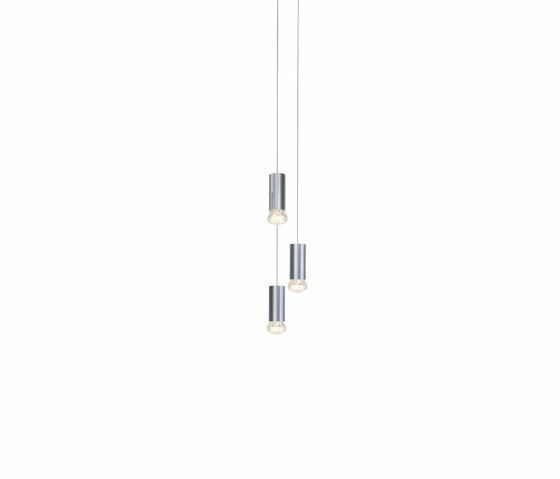 Each individual pendant varies in length and can easily be hung in various compositions due to the specially designed plug and play connection system There are 11 standard rectangular and circular ceiling plates available to fit each specific project and minimalistic 24v dot connections. Available colors: Champagne, Silver, Anthracite, Black and Gold this delicate lighting fixture will truly be a piece of jewelry in as well hospitality as domestic projects. Stores and windows, above tables in dining rooms and restaurants as well as in foyers and lobbies.